I have tried to remain calm for oh so many years now. 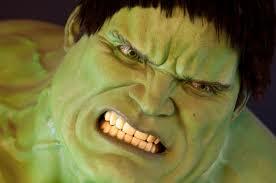 I realize that a certain, constantly maintained level of anger is not good for ones health. Therefore I try really hard to find that equilibrium of emotion that keeps me from hitting too many "peaks and valleys." People tell me that I should not be so angry, that it's not worth the aggravation. But I ask you, "At what point is enough enough?!" There are issues, occurrences, even people, which just push me to the point of saying things that I know will cause knees to jerk and friends to distance themselves. Things that are just so egregious that the only proper response is unremitting anger. Perhaps the most annoying of these is people, people who are hypocritical, people who are single-minded, people who refuse to see anything outside the little cocoon they have enveloped themselves in. Yet these people have the nerve to tell the rest of us what we should think, how we should act, what we should find important, in spite of the fact that they simply will not entertain any information that may conflict with their world-view. These are the kind of people that have me fuming right now. In fact, it is a particular kind of person, a political person, specifically Republicans or people who identify themselves as such. But, Floyd, you will ask (You know you do, I've heard it before), "Why are you always picking on Republicans?" I pick on Republicans, at least the ones who fit the aforementioned descriptions, because they are exactly the kind of hypocrites that I loath with a white-hot passion. We all know what to expect from Democrats. They are and identify as liberals. They make no bones about it. Their ignorance, selfishness, and love of big government are on display for all to see. You know what you are going to get with Democrats, they show it in their every word and deed. It's like being surprised that a crack addict would steal from his grandmother to buy drugs. It should surprise no one. But Republicans, so many of them just make me want to throat-punch someone. Why?, you ask. Because they talk one game and play another. They say things, post things, write things that would have you believe that they care about such things as freedom, limited government, and personal responsibility, but if any of you dare try to exercise any of those things woe be unto you. How often do you hear Republicans cite one or more of our Founding Fathers to exhibit their agreement with that Founding Father on a particular issue regarding liberty or limited government? How many times have you seen them post or talk about resisting government tyranny (From my cold dead hands)? How often have you heard them speak, in glowing terms, about how our Founders fought a war to create this country over nothing more than onerous taxes? You know what I am talking about, you have seen it. Now think about the abuses that our government has heaped upon us just over just the last forty-years and ask yourself, "What would our Founders do?" These same Republicans will tell you that they don't trust the government or the media, yet there are some stories that the government/media feed them that they soak up like a sponge. No skepticism, no questions asked, no demands for the truth, just blind, unflinching, unquestioning acceptance. Why? Why do they say they don't trust the government/media, but then accept certain stories from them when told? Could it be the same fear that strikes the hearts of Republican politicians throughout the country? The fear of being called names? The fear of being painted as unpatriotic? The fear of being called a militant? You tell me, I'd love to know. Yesterday an American patriot was killed, some say murdered, by law-enforcement in Oregon. We will learn more about that incident in the coming days, but for my purposes here I ask that you bear with me. This man was part of a group of American citizens, some veterans, others just concerned patriots, who had had enough of the tyranny of the government in the form of the Bureau of Land Management (BLM). The government's continued abuse of eminent domain and taking land from private owners with no due process or just compensation was more than they were willing to tolerate. Anyone remember the Fifth Amendment? Does the Bill of Rights matter anymore? Do U.S. citizens have any rights left? Their crime was to occupy an empty federal building on federal land. By the way, who pays for that federal building on federal land? While they were indeed armed, as any good patriot should be, they had attacked no one, shot at no one, threatened no one. They simply sought to expose the government's abuses by making a stand on their rights under the Constitution. Having sought redress of their grievances through other means, they took steps that I feel our Founding Fathers would surely have approved of. I have seen many stories posted about this incident since yesterday. In many of them the patriots are called "militants" or "domestic terrorists." I wonder if our Founders would agree? You remember the Founders don't you? The same guys you are always citing to show your "patriotic credentials!" I have seen many Republicans posting about how they "got what they deserved" and they should all go to prison, etc. These are the same Republicans who will, in the next breath, tell us all how they will not allow Obama to take their guns or that they want to "take their country back." Well, Mr. & Mrs. freedom-loving Republican, exactly how do you see that happening? How has that whole "ballot box" thing been working out for you? When the colonies sought redress of their grievances with King George III did they continue, ad infinitum, to send letters and ask nicely? Stop talking about it and actually think it through, HOW DO YOU "TAKE YOUR COUNTRY BACK?" The militia patriots in Oregon sought to make a point and to exercise their rights as Americans in doing so. Do we have a right to resist tyranny, even if that tyranny is our own government? What are the limits on our patience? How much must we take? How much abuse is too much? Does the Second Amendment still matter? What do you think that Amendment is for? But here it is. Here is the real reason you just can't bring yourself to stand up against this abuse. Here is the real reason you just will not support such actions by freedom-conscious Americans - You simply cannot bring yourself to say that the law or the people enforcing that law (the police, the FBI, etc.) are wrong. You still hold to some untenable belief that one should never fight back against the police or our military, even if they are being used to enforce unconstitutional laws or to contribute to our enslavement. Why, it's akin to being labeled a racist when you disagree with a Democrat or an Obama policy. You just cannot handle being called a name, can you? How do you do it? What sort of twisted logic must one engage in in order to justify two conflicting standards of behavior? Fight tyranny! Take our country back! If guns are outlawed, be an outlaw! This country was founded on fighting tyranny! But whatever you do don't resist the police or fight back against the military, because that would be unpatriotic. You people disgust me in ways that I cannot even articulate! Thankfully this post helps to serve as a sort of therapy for me. It is cathartic in that it allows me to vent and there are times when we all must vent. However, it does not change the loathing I have for you hypocrites and know-nothings. You really should stop talking, writing, or posting about freedom and limited government until you educate yourself and truly understand what that means. Freedom, winning freedom, taking back freedom is not always a pretty, easy, uneventful process, but you must ask yourself, "Is it worth it?" To answer yes means that there may be things you will have to do that will make you uncomfortable, that may even be dangerous, but if freedom is truly what you seek, then they must be done. And if there are those who are willing to suffer the slings and arrows in that venture you could at least recognize and support those efforts, rather than taking the side of the oppressor. Wake up!